Caspar David Friedrich is one of the leading exponents of German Romantic painting. Throughout his life, he sought communion with nature as a means of expressing his feelings and ideas, his hopes and yearnings. Friedrich’s landscapes are open to a profound religious interpretation. The one here, for instance, is imbued with a rich symbolism that successfully conveys his message to the viewer. Everything in it has meaning: the moon and the dawn are symbolic of death and the hope of eternal life; the season chosen—late winter giving way to early spring—is linked to the Resurrection. This beautiful painting formed a pair with the canvas entitled Early Snow, now in the Hamburg Kunsthalle. 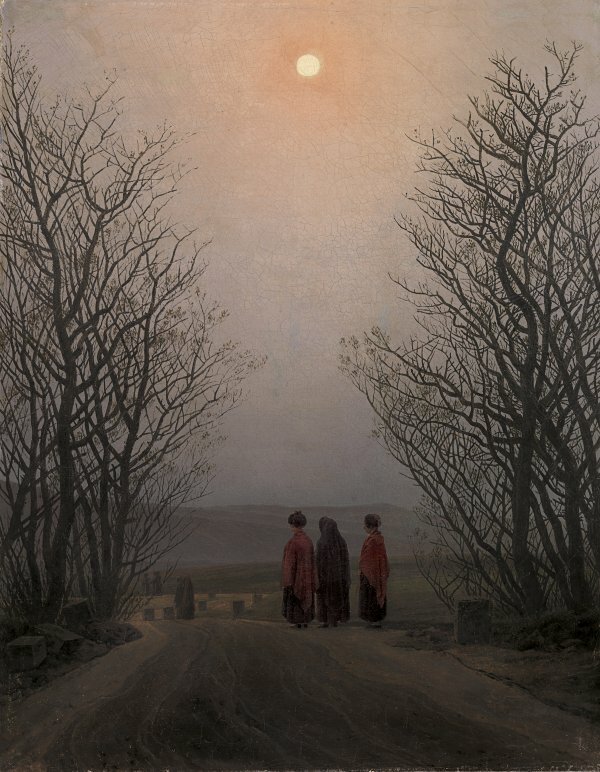 German Romanticism is represented in the collection of the Museo Thyssen-Bornemisza with a work by Caspar David Friedrich, the leading artist of that movement. Easter Morning has been dated to the artist’s mature period before the attack of apoplexy that he suffered on 26 June 1835. From that date onwards he abandoned oil painting and produced watercolours and sepia wash drawings. The present canvas belonged to Wilhelm Wegener who described it in 1859: “Three women [in the foreground] walk stiffly towards the cemetery very early in the morning. It is not yet light and the moon is still to be seen high up in the sky although it no longer illuminates the landscape or casts shadows. The old trees on either side of the road are putting forth new shoots and in the fields one sees the green stalks that have survived the winter. Nature is celebrating its reawakening”. In addition to being a faithful description of Friedrich’s painting, this passage from Wegener reflects the mood of the artist’s entire oeuvre. The present canvas formed a pair with a work in the collection of Wilhelm Wegener entitled Early Snows, now in the Hamburg Kunsthalle, whose measurements are identical. In the present canvas Friedrich uses a high viewpoint to locate us on a steep, winding path that disappears in a bend in the road in front of a dense grove of trees. The snow has left its mark on the ground and on the needles of the pine trees. The present canvas has been compared to another work by the artist, Walk at Dusk (now in the J. Paul Getty Museum, Los Angeles), dated to around 1830–35. There is a sheet of drawings of figure studies for both these compositions in the Kupferstichkabinett in Dresden. In the lower part of that drawing Friedrich included the three groups of women to be seen in the present painting on the road leading to the cemetery, drawn to the same scale in isolation and without the landscape setting. In the final canvas, however, they appear in reverse. Also included in the drawing is a study for the man in the forest in Walk at Dusk, in front of some rocks and with a huge horizontal rock above him. The moonlight and contemplative mood of the figures seem to indicate that the figure is meditating on his discovery. Easter Morning was acquired by Baron Hans Heinrich Thyssen-Bornemisza at auction in 1973, having previously been on the UK art market. Following its acquisition it was loaned for around one year to the National Gallery in London, where it was cleaned and exhibited in Room XXI. 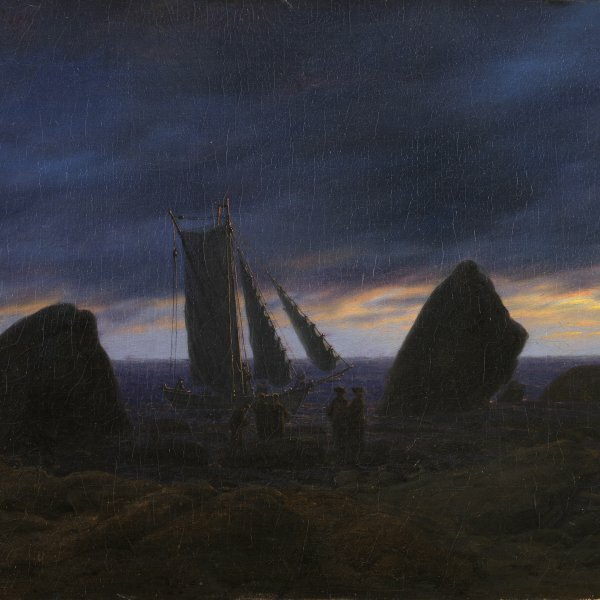 Friedrich’s silent and profoundly meditative landscapes contain a symbolism that alludes to life and hope, expressed by the artist through his unique iconography. In this work, as in others, Friedrich used specific elements to communicate a religious message, but without making use of a traditional repertoire of images. Landscape is the medium through which the artist conveyed his ideas and with which he expressed his own sentiments. In the present canvas a number of silent figures, seen from behind, pause beside a path that begins in the foreground. The bends in the path that leads the viewer’s eye into the fields are used to house a further two groups of women also in calm, silent poses. As in Early Snows, this path carries the spectator’s eye into the pictorial depth, and Friedrich assists the spatial flow by locating the women on its edge, as if waiting. The moon, still visible in the sky, is counterbalanced by the glow of the cold light of dawn that begins to flood the horizon. Both the moon and the dawn, together with the idea of winter giving way to spring, have been interpreted as references to death and to life after death. The message of hope transmitted by this canvas makes Easter Morning a clear reference to the Resurrection.